A woman allegedly broke into her mother’s house during her funeral to steal a safe filled with $90,000 worth of items. Police found a car linked to Alyce Davenport, 30, with the safe in the trunk. Davenport allegedly slammed it shut when officers attempted to look inside. 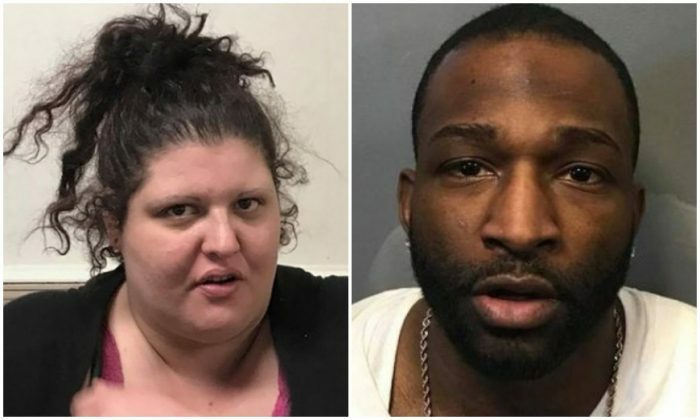 The theft came to light after Thomas Baillet, the mother’s fiancé, told police that someone had broken into his house during the funeral of Audra Johnson, Davenport’s mother. According to the Boston Globe, Baillet came back from the funeral to find his bedroom door forced open and a safe that contained jewelry, stocks, saving bonds, coins, and other valuable items missing. Baillet told police he believes Davenport broke into the house with her boyfriend, Diron Conyers, 27. He also said Davenport didn’t attend her mother’s funeral and wasn’t reachable by phone during or after the funeral. Davenport was recently kicked out of the home over her drug problems, according to a police report. Police found Davenport’s blue Honda Civic early Saturday, Jan. 6. It contained the broken and blood-stained safe, which appeared to have been pried open with a tool like a screwdriver, according to court documents. Police seized the safe and left without arresting Davenport. They notified a different police department that then later went to Davenport and Conyers’s motel. They discovered a real estate contract relating to Johnson’s address and evidence of cocaine use. A search of Davenport’s car revealed coins valued at over $5,000, a bag of knives, and jewelry. “Alyce has a history of larceny, identity theft, and forgery,” the police report states, according to the Telegram & Gazette. Court documents also show that Conyers has a lengthy police record including charges of armed robbery. Davenport is being held on $15,000 bail, while Conyers was held without bail. They are due back in court on Feb. 6.